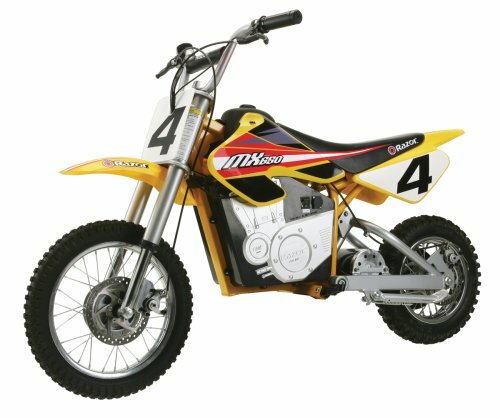 Are you looking for the ideal motocross bike? Have you been searching for the perfect racing bike for you but have had trouble coming across the best one? Well, look no further! With the Razor MX650 Rocket Electric Motocross Bike, you will have the greatest motocross bike available right at your fingertips, taking you on the journeys you have been waiting for. This compact electric motocross bike can take you to the next levels and the next adventures you are seeking. For the budding thrill seeker, this is the bike for you. Take a look at why the Razor MX650 will be the best bike for you and why it’s aptly known as the King of the Hill. The Razor MX650 is a high-performing electric dirt bike that comes complete with a styling inspired and empowered by Supercross racers. Coupled together with total steel construction, this bike features a high-torque motor and dual suspension for added strength and racing power. 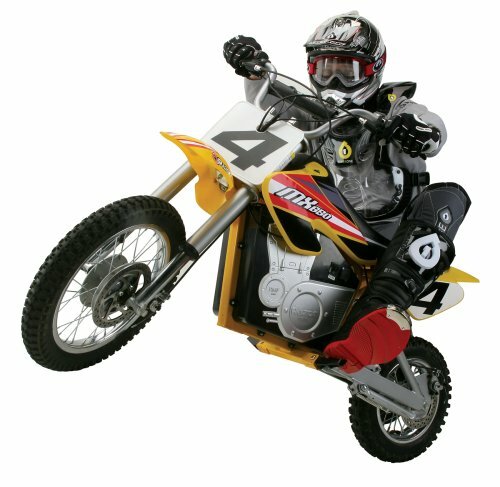 This dirt bike is able to reach speeds of up to 17 mph and can operate for 40 minutes of continuous use on a single charge. The variable speed feature on the bike gives the rider control of maintaining intended speed throughout the entire ride. Acceleration is controlled with a twist-grip and the dual disc brakes are hand operated. 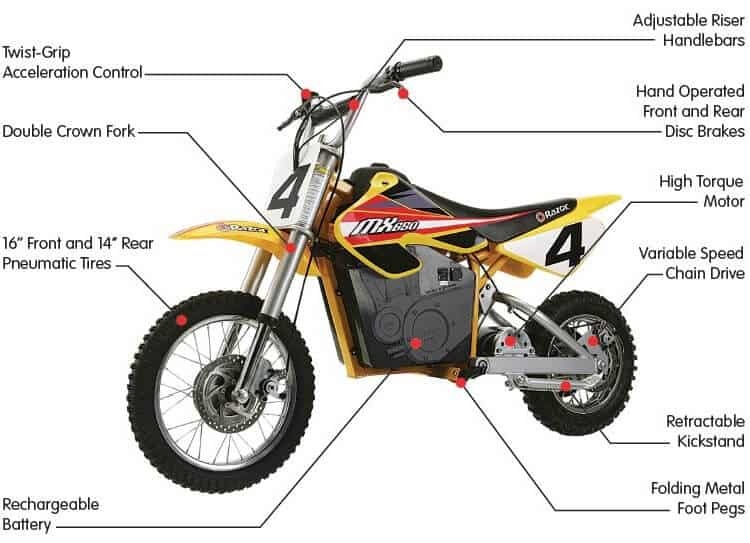 The Razor MX650 dirt bike also includes a large 16-inch front tire, a 14-inch rear tire, dual suspension, adjustable riser handlebars, a double crown fork, a retractable kickstand, a frame that is authentic to dirt bike geometry, and folding metal foot pegs. With the bikes design and features, it is able to produce additional power for when riding uphill or off-road. Able to hold up to 220 pounds, the Razor MX650 has a battery charge time of 12 hours. 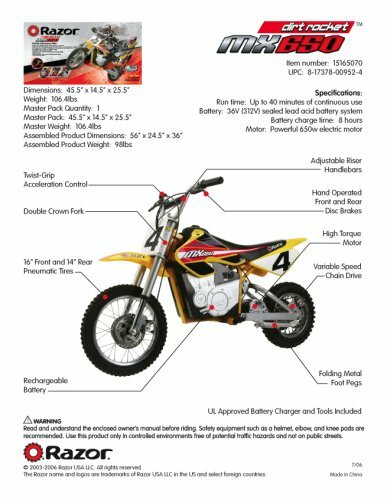 This bike is recommended for riders ages 16 and up and includes a standard 90-day warranty on the bike’s purchase. The bike has been praised for its strong steel construction that is able to endure challenging obstacles and environments. If you happen to experience a slight fall, you can rest assured knowing that the bike will be able to handle the force and won’t suffer much damage. Additionally, the bike is naturally designed to keep the rider as safe as possible, so you too can rest assured knowing that you will be taken care of. However, always be sure to use the proper riding gear and protection to ensure that optimal safety is practiced. Able to completely travel off-road, this has been described as one of the bike’s key features as well. 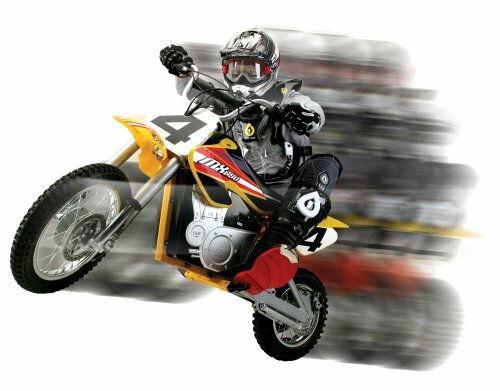 So Razor has proven the ability to create best-selling riding vehicles for kids, such as Razor ATV. Now with MX 650 two-wheller fans will get a great option. 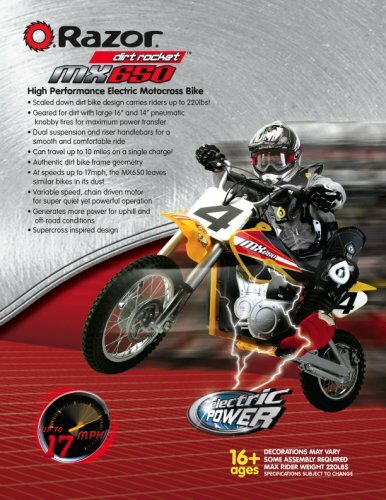 If you are looking for the best motocross bike available, then you must take a look at Razor’s MX650. This bike is known as “The King of the Hill” and for very prime reasons. With the bike’s strong steel construction, powerful electric motor, variable speeds, dual suspension, off-road tires, and overall general presentation, this is the bike perfectly created for the budding adrenaline junkie. 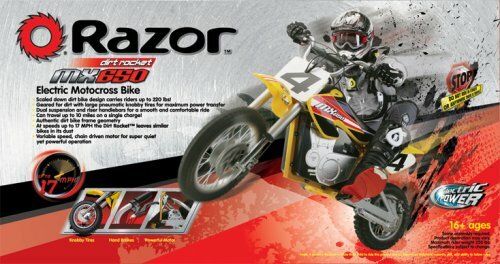 Take your adventures to the next level today with the Razor MX650 Dirt Rocket!